This past week we were looking for some possible upside breakouts on the SP 500, Gold, and Biotech. However after the initial moves up, we ran into significant downside volatility. Some of this had to do with the SP 500 running out of gas after a near 260 rally off the 2532 lows. The market also used the excuses of Tariffs on Steel and Aluminum along with speeches from a new Federal Reserve chair to take profits. This looks like it may be a Wave 2 down to us after a huge rally. 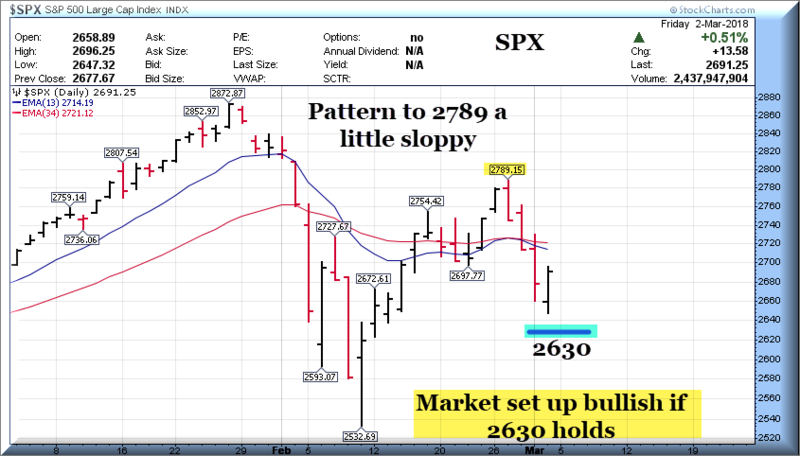 So far the lows of 2647 are within 17 points of a 2630 typical retracement point we laid out for SRP members to watch. The Biotech sector also was close to a two week consolidation breakout and then got hit with overall market selling, but did rebound sharply on Friday, helping our LABU 3x BULL ETF trade move up nicely off the lows the prior day. 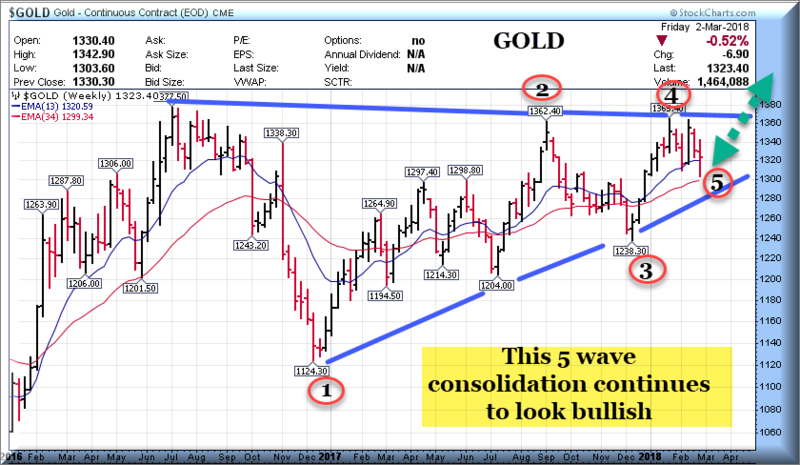 Finally, Gold did pull back sharply hitting a 1304-1310 bottom zone we pointed out earlier in the week to SRP members in the morning reports to watch. This remains in a long term Bullish 5 wave triangle pattern. 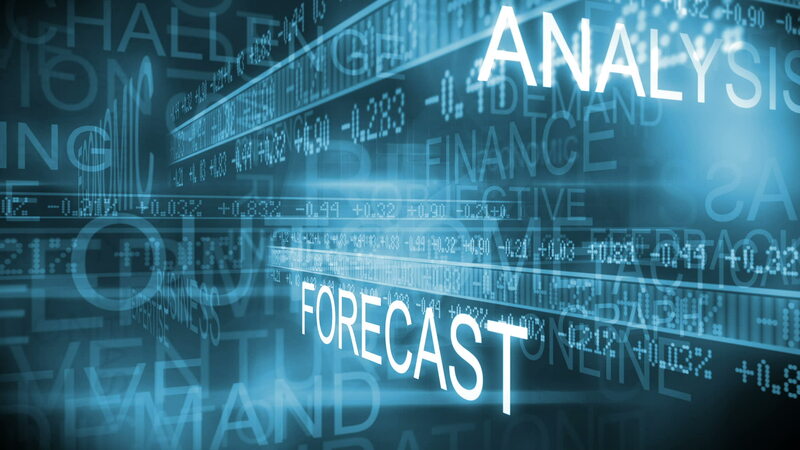 Essentially the markets are a little sloppy here as we continue to see massive FEAR readings which typically would indicate higher levels in the market are ahead after this pullback. We are showing the typical SP 500 chart with 2630 support level. 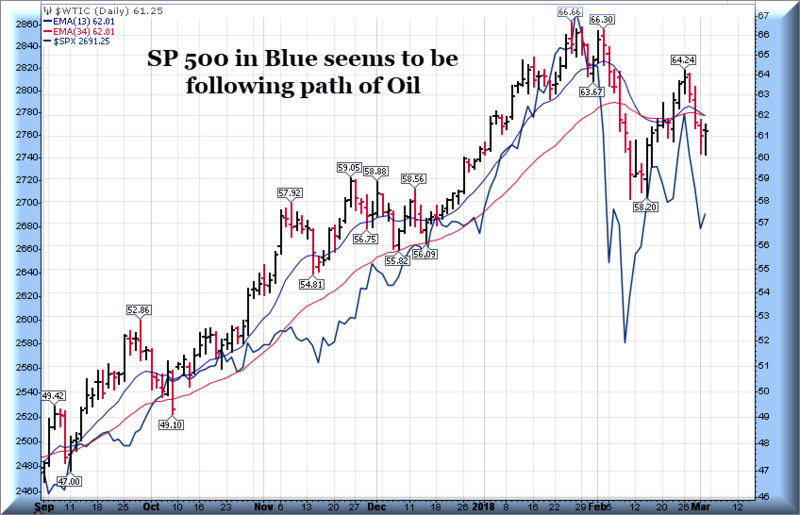 Also this week an interesting chart showing SP 500 tracing out Oil movements over the past 8 months or so. 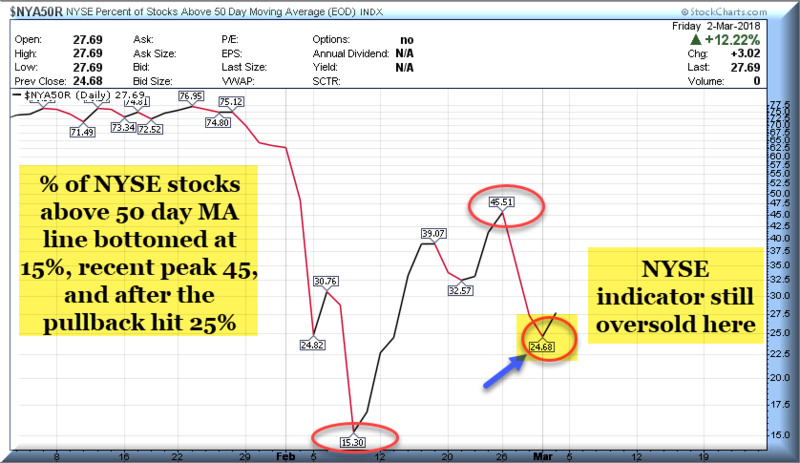 We also are showing a chart on the NYSE in terms of percentage of stocks above the 50 day moving average line. In addition, the CNN Fear Gauge is running at extreme fear readings, and finally a look at the long term chart on Gold. Market still at extreme fear readings. The Percentage of Bullish Investment Advisors has cratered to 46% from 68% highs many weeks ago, this is more bullish now on a contrarian basis. 2630 is key support for SP 500 on this pullback. Swing Trade Candidates: 12 swing trade candidates with nice base patterns. We often drill down on a few and consider them for actual SRP Alerts, but this also gives our members some other ideas as well.